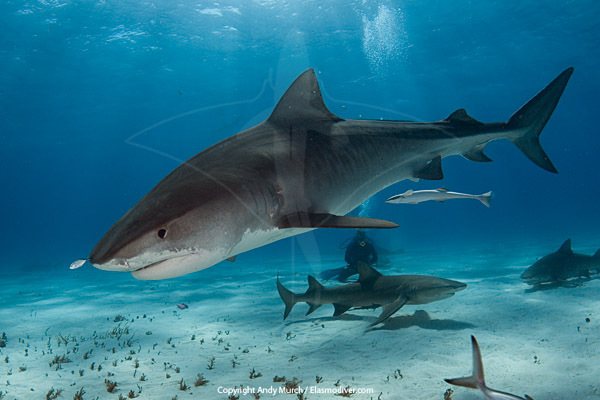 Encounter: Tiger sharks, Great hammerhead sharks, Lemon sharks, Bull sharks, Caribbean reef sharks and possibly Black tips, nurse sharks, and more. This is probably the most dynamic shark adventure in existence. Most of the diving is conducted in blue water and involves copious amounts of chum being poured into the water to form a chum slick that attracts large sharks for miles around. Once a large Hammerhead or Tiger shark arrives, divers are invited to enter the water and hang on lines suspended from the swim step close to the chum. 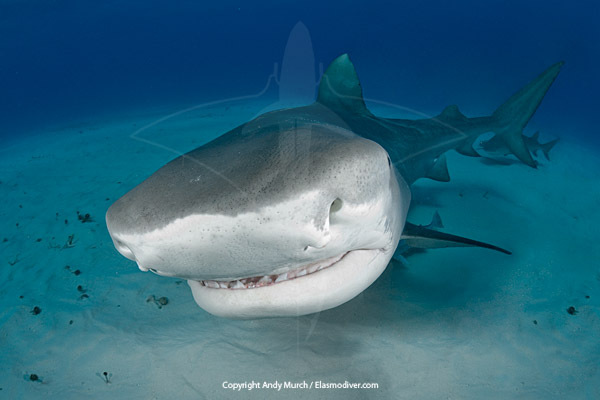 Its possible to get very close to the sharks and the photographic opportunities are unparalleled. The ever present Caribbean reef sharks can get quite aggressive towards divers that are near the bait, but the larger Tigers and Hammerheads tend to be skittish and avoid close contact. Some encounters are organized on the reef itself and then lemons and Bulls are also seen. The sharks are never absent completely but the Tigers and Hammerheads which are the big ticket species are not always present. I was once lucky to see 4 Great Hammerheads during an 8 day trip and it is sometimes possible to see a dozen or more Tigers. 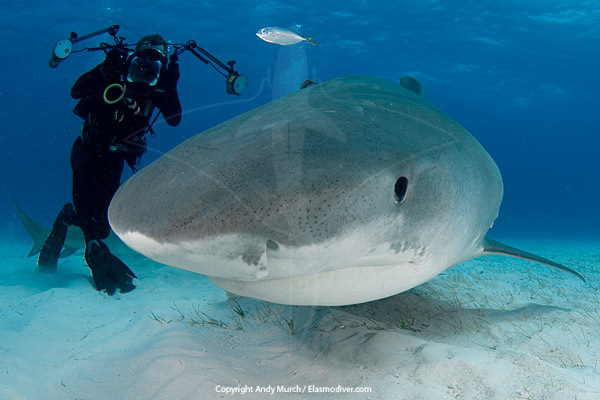 Occasionally the tiger sharks can be quite aloof and it can become difficult to get close to any Tigers so (like many other dives) luck is a factor in the overall experience. Operators: Big Fish Expeditions runs one or two dedicated Tiger Beach trips each year aboard the Dolphin Dream. Accommodation: The Dolphin Dream is a comfortable 85ft liveaboard. Its not a fancy 'chocolates on your pillow' kind of boat but the food is good, the crew are friendly and helpful and the captain knows how and where to find sharks. Read the Elasmodiver Hammers and Tigers Article from Dec 2003.